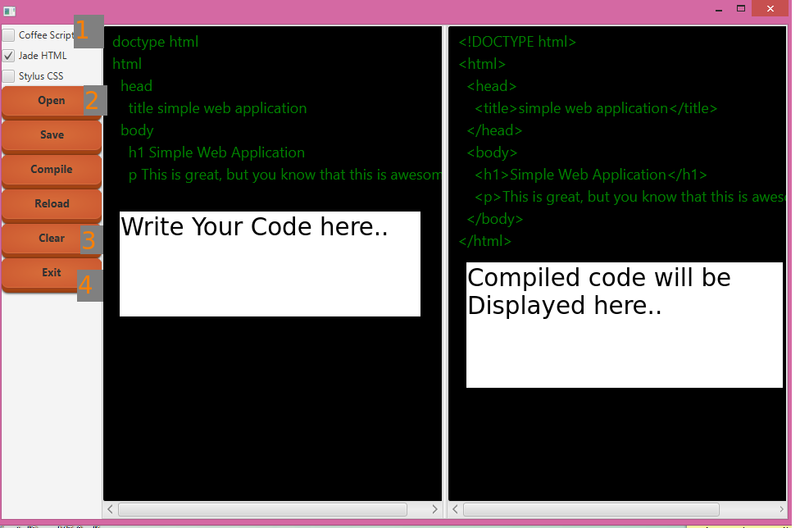 # This is not an IDE for Coffee-Script/Jade/Stylus, This just helps you to play and learn them very effectively. Currently I have upload binary file only for Windows Operating system, But As This tool is written using JavaFX ( Basic4Java) this will seamlessly run on any platform. # Interactive Environment for Coffee-Script, Jade and Stylus CSS pre-processor. # No need to Download other binary or extra file. # Free, Portable and open-source, just download and install. # Embedded node.js binary and node package manager so that you can easily extend its features. # Have you ever used Coffee-Script/Jade/Stylus Language before, These are complete languages or you can say they just extends the features of their parent Languages. # LiveCoder gives you power to use this languages with installing and configuring anything else, Just download and extract the content to your defined Directory and you are ready to go. Helps you debug your application if anything goes wrong..
# LiveCoder-r4-x64.exe -> for running LiveCoder without CMD for 64-bit System. # Now run the executable for Livecoder as your needs. # Now you can clear contents ( Using "CLEAR" button) if you want and write your own code and you can see the compilation results on fly, there is no need to save and then compile LiveCoder will Do that for you. # So, It was so easy.